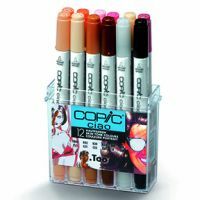 Copic Markers are the finest marker system available for designers, artists and Manga illustrators. Manufactured to exacting standards by the Too Corporation in Japan, the original Copic Marker range is available in 214 colours including 44 shades of grey, have replaceable tips and are refillable from Copic Various Ink bottles. The twin tip Copic Marker has a traditional chisel tip for coverage and a precision nib for detail. This flexibility has seen the pen favoured by design studios, Manga artists and illustrators worldwide. Copic Ciao Markers are fantastic value graphics marker with all the usual Copic quality, but at a lower cost. They contain the same high-quality ink as the original Copic Markers and are available in 180 vibrant and pastel colours (including a colourless blender). Copic Ciao Markers are ideal for most sketching and design purposes, use virtually odourless alcohol-based inks and have a Twin-tip design that gives you a general purpose medium chisel tip and creative brush tip in one pen. Copic Ciao Markers can be refilled with Copic Various Ink refill bottles, by pulling out the chisel nib and filling from the bottle.